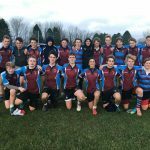 The Newquay Tretherras year 11 rugby team played what is likely to be their final game together in a 53-34 defeat against a strong Truro School side in the semi-final of the under 16 County Cup. The game was played in fantastic spirit throughout and with some excellent rugby from both teams, it was a positive way for the Newquay Tretherras team to finish their run. Newquay Tretherras would also like to take this opportunity to say congratulations to Ben Hammersley who has been selected in the Exeter Chiefs Academy squad to play South Africa Schools Under 16’s at Sandy Park on Wednesday 5th December, a fantastic achievement.